Automation Anywhere, a leading robotic process automation (RPA) vendor, envisions the emergence of a new economy–the bot economy. To support this burgeoning economy, it launched its Bot Store in March 2018 to encourage and facilitate the development of bots to perform business processes. 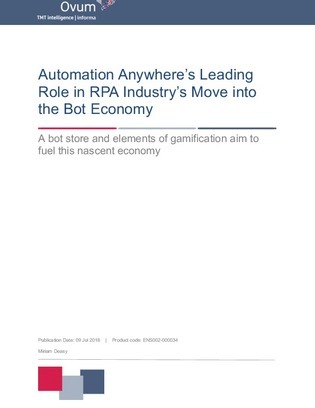 Download this report to learn more about Automation Anywhere and their RPA platform, and explore trends and predictions for the bot industry.